I was lucky to spend one month (from 31st of December 2013 to 30th of January 2014) traveling through the beautiful island of Cuba from the very East to the very West. It was an amazing experience by many levels and I have decided to write about it for several reasons, first of all and most importantly, because I want to look back at these diaries and remember every single detail of that experience, I want to remember my feelings, the people I met and the places I saw for as much as possible. Second, I have many friends from back home who admire and love Cuba (for no specific reason, just as I did) and I want to share these diaries with them in the hope that they will also have such an opportunity one day. Third, most – if not all – you can read about Cuba is from a very western point of view, I don’t claim my point of view is any wiser or more accurate but I hope and I think that it is different. These will be very personal diaries, mostly portraits of people I met during this trip, it is not a travel guide (there are plenty of those online). As I said, it’s mostly for my personal satisfaction and amusement, but in writing them down, maybe one or two of you will also find them interesting to read. Woke up at 8, only 3 hours of sleep, went walking around with Sam to Vedado to give my final goodbye to Che and Camilo in plaza de la revolución. Then walked through the malecon towards Centro Habana. I love Cuba. Back in the hostel, I called Reinier who said he will come soon, took a shower, chitchatted with Juan the good-hearted dueño de la casa. Reinier came, it’s amazing how you can make a good friend in a place so far in a matter of few days. Human connections are weird. I said goodbye to everyone, even Ipek who was mad at me for the past few days. I didn’t feel much, just a feeling of emptiness, no sadness (the first time I felt sad is now writing these words in the airport waiting for my flight). I went down with Rey, hugged him goodbye promising that we will meet again. One of few promises that I have no doubt I will keep. Now am sitting at the airport, the feeling of emptiness is replaced with deep sadness and mixed thoughts. Thoughts that I really want to keep this “me” when I go back, this “me” though flourishes from being a foreigner, a stranger, it loves this challenge and lives for it. It is ironic that in my search for a home, I realized – some 30 years into my life – that my home, my comfort zone, is in being homeless. I love Cuba. I love how it pushes your limit with its eccentricities, with its lack of logic, how it questions the rules of the world and does its thing in the way it likes regardless of what everyone thinks. Cuba is young, rebellious and beautiful in and out, and it is the least rigid land one can imagine, don’t let 60 years of apparent political stagnation fool you, the soul of salsa and rumba has no place for stagnation, a stagnant society would never be able to dance, laugh, do sports, arts, medicine and business in the way Cubans do. A stagnant society is one where people lol on Facebook instead of laughing out Loud on the streets, and retweet about football instead of lively debating it in the middle of a Havana park. A stagnant society and system is one whose members waste the best years of their life chasing an elusive retirement house, be it in heaven .. or south of Spain. Cuba though is young, rebellious and full of life. I made it back to Cienfuegos again. I felt I needed to see the family from the Casa and my good friend Amet one last time before I leave. On the bus, it was unbelievable when I received a message from Amet asking where I was and if I will come to Cienfuegos again. He didn’t have a clue where I was but he sensed I might be somewhere around, he said. I arrived in the early afternoon and headed directly from the bus station to the “Rastafari” gallery and over there I met Carlos who greeted me warmly introducing me as “our Sudanese friend”, we went looking for Amet at his home and on the malecon. Meanwhile he told me again about his project and how they finally secured a projector and it is now only about getting it from Norway to Cuba, he also told me how slow it was in the gallery, haven’t been able to sell anything all week. They depend totally on foreigners buying art and souvenirs to keep their gallery running. Carlos is one of those charismatic leaders types of figures, he has big dreams, very focused on his mission. He told me he stopped approaching tourists because they all assume he is just a “jinitero” and he doesn’t have energy nor does he feel the need to prove anything to anyone. We finally found Amet, and we sat together on the malecon talking about all sort of stuff but mainly about women, his woman and mine and many more that passed by. I found out that on that other night in Trinidad, he wanted to spend the night at our Casa but the landlord refused. “He assumed I am just another black Cuban chasing tourists”. Amet offered me to spend the night at his place and I gladly accepted. 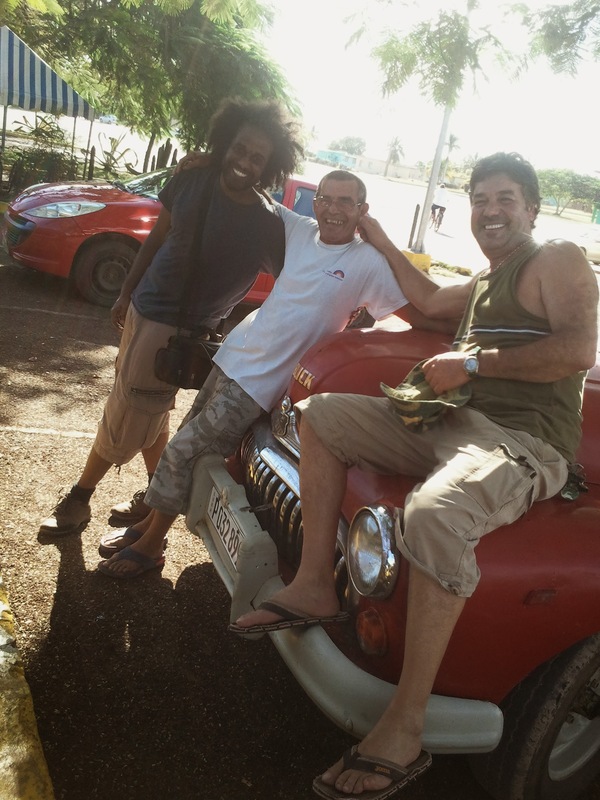 I – then – went to say goodbye to Yanitsy and Willian, the owners of the Casa where I stayed the first time I came to Cienfuegos. When Willian saw me on the street, he came running after me from the other side and hugged me murmuring my name that is still proving difficult for him to pronounce. He went in and told Yanetsy that he has a surprise for her. She asked me whether I got her greetings for my birthday – which I didn’t – but she showed on her phone that she sent it and she didn’t forget about me. It feels like family with Yanetsy and Willian, and I am glad I came back to say goodbye to them. We spent a good hour or so and then I said goodbye promising I will come back again one day. Amet has a true pure artist soul. Artists in poor countries like Sudan or Cuba are just a pure act of cruelty from the gods. He has a very open philosophy and look on life, he told me about how racist and judging Cuban girls are, even black girls, and how that the first time he was told he is beautiful, was by a French girl. “Only then did I discover my beauty”, he said. Amet and me have many characteristics in common, a contradictory personality in many ways, on one side, extremely open, on the other side very shy. And both sides manifest themselves in extreme ways that people can easily miss the other side. “It is my constant battle to combat my shyness” says Amet, but anyone who sees him on the dance floor can easily miss this shyness, the same way that someone who sees me poking random strangers into random conversations in Cuba, can’t imagine me sitting in front of a computer coding for 9 hours without socializing with anyone. We have multiple faces like most people, but I could recognize his multiple faces because they were familiar to me. We are both tormented in different ways and for no apparent reasons, but as our common good friend Betty once said “it is better to be tormented than superficial”. He told me the story of his muslim name and how his Christian mom chose it because he was born on the same day as prophet Mohamed. She considered it an omen. He then went away for some time and came back with a delicious dinner for me which I was very thankful for. When I asked why he is not eating, he went back and came with a plate for himself, half-way through finishing my plate, I noticed he wasn’t eating. He told me he doesn’t eat much, he also doesn’t eat meat as an effect of Rastafari religion, he is not a Rasta, but “takes from each religion and culture what makes sense for him”. Cubans have an impressive liberal view on religion, I will go specifically to Cuba one more time to explore it more. We talked about his pakistani friends, and how he feels they look down at his culture and country, something I confirmed when I met them the next morning, opening up to me as a fellow muslim, they were full of contempt for this culture that doesn’t know about the afterlife. I always find that attitude very arrogant and border-line ignorant, I consider it similar to the western subtle arrogance when looking to other cultures, maybe that’s why they will clash and fight until the last person standing. They are just too similar. Although in the case of the Pakistanis looking down at Cubans and their way of life, it felt even more ignorant and superficial than normal, because this Cuban culture has more tolerance, beauty and equality than any muslim society and that’s the core of Islam or any other religion. Amet told me about his opportunity to go to Czech republic and how it could open new doors to him but he doesn’t want to stay there and can’t leave his mom, sister and friends behind… And I chose not to tell him that this is exactly what I said 6 years ago when I first came to Europe. Heading from Viñales back to Havana, our group grew to seven people, from Taiwan, Iceland, Britain, Sweden and of course Sudan. We stopped at las Terrazas for few hours, a beautiful peaceful place, too boring for my taste. In Havana, I went back to the casa where I started my trip, it felt like rejoining a family and I was happy to see them all and they were happy to see me. I came back with 4 other travelers and we were lucky that there was exactly 5 beds left. Meeting Ipek again was a beautiful unexpected surprise, I was sure that she would have left Havana by now. Nice surprise and good warm feeling. In the hostel, we had another delighting addition to the group, a 22 years old polish girl doing an anthropology research in Cuba about old cars. We arrived late in the afternoon, relaxed for a little bit then we all went out to meet Reynier, the good Cuban friend I bumped into in Playa Larga. We met in Habana Vieja in a place known among tourists called Chanchullero. Although Rey was with his his friends, and they were obviously up for something more fun and less expensive, he insisted on being with us. He remembered that today was my birthday as I told him when we met before that one of the reasons to come to Cuba is that I wanted to spend my 30th birthday somewhere far and special. He insisted that I should have a proper celebration cuban-style. His friends wanted to leave Chanchullero as soon as possible, as it was an extremely expensive tourist trap as far as they are concerned, they would normally pay 10 cuban pesos for a cocktail when this place charges 75 (75 is about 2 British pounds). Anyhow, we headed from one place to another insisting on having a good night somewhere that is both nice and not a ripoff, we went around, and after 3 failed attempts, we ended up in a cool club that is normally open until 7 in the morning. Once we got in, the electricity was cut from the whole neighborhood! Testimony to Cuban spirit, Rey and his friends, just formed a group and started dancing and singing under their lighters’ fading light. Then we recovered our friend James – who we lost somewhere along the way in one of the other clubs – and the Icelandic girl Katrin started playing on a piano in the dark. Beautiful. On that beautiful background of classical music on one side and Cuban rhythms on the other side, I was chatting with Susanna – the polish student – about all kinds of matters from the silliest to the deepest and most philosophical. And I realized then that I was spending my birthday in the most special of ways, with people I love – although I didn’t know any of them two weeks ago, in a dark Havana club, electricity cut as if it is a Khartoum summer night, with Reynier who looks like a brother of mine, his beautiful friends, icelandic background music, beautiful company spreading the world from Taiwan to Cuba. As far as I am concerned, this is Home. My favorite experiences while traveling in Cuba are about people. It was amazing and surprising how everyone you approach seems to have an interesting story to tell. After my first few days in Havana (which I didn’t enjoy very much), I learned a valuable lesson, I put my camera away (benefiting from the fact that no one recognizes am a tourist without a camera or a white person by my side) and then I started approaching people instead of being approached. This was the turning point of my trip. One of the random people I met is this gentleman who was part of a band playing in Punta Gorda in Cienfuegos. When they finished playing, I started talking to them. Normally when I say I am from Sudan, people either mix it up with South Africa or tell me that there is a war over there (which was all over the news when I arrived to Cuba). I was in shock. He did look like a Cuban brother of Gaafar Numeiri indeed. Numeiri – in case you don’t know – is an ex-dictator of Sudan who ruled the country for 15 years before I was even born. Still in shock, I asked him how he knows about Gaafar Numeiri, he told me that his best friend in the 80s was a Sudanese medicine student who studied in Cienfuegos, and this friend used to call him “Mr. Gaafar Numeiri”, and he never forgot that name ever since. We talked more about Sudan, Ethiopia and Africa. And his knowledge was impressive, he told me a lot about Africans living there in Cienfuegos and in Cuba in general, and corrected me when I said that Mengistu was a communist, saying that he was just a “leftist”. Like most Cubans, their knowledge and education is impressive and obvious (especially pre “special period” generation as I came to understand afterwards from other Cuban friends), it is not just study-books knowledge but openness and curiosity to the world that you barely see in other parts of the world. I listened to one last song from Gaafar Numeiri’s band and said goodbye. I couldn’t help but to imagine how different my country would have been if the original Numeiri also chose music instead of politics. After few hours in Playa Girón, mainly to visit the museum, I said goodbye to Miriam, my German travel companion, as we were going in different directions now. I realized that it won’t be easy to get to Cienfuegos with local transport and I have to wait for the touristic Viazul buses. To kill the time while waiting, I went to a bar to drink and eat something and a man in his late forties started talking to me, pointing to a couple of blond tourists standing next to me, I couldn’t understand his slang but I got what he meant from his gestures that were pretty universal. He took it to himself to start teaching me Cuban Spanish, or mainly, how to describe and talk about women in Cuban Spanish. I doubt there is any language/culture in the world that has as many ways to flirt with women or describe them. I listened carefully to my teacher’s light humorous lesson, we laughed and I invited him for a beer, a second one, a third one … we had plenty of time to kill. Miguel is a doctor but he works as a taxi driver as well to earn extra cash, he has a triplet of girls, 20 years old who are just graduating university. We started talking about all kind of things, avoiding politics, I found out that the most genuine people I met are the one who avoid politics. He didn’t need to talk politics though, a doctor having to work on a taxi to provide for his family, says enough and shows you the other side of the socialist dream. Although I admit I admire many aspects of socialist Cuba, I am also aware that it is far from perfect in many others, quiet often, it feels like it achieves equality by bringing many people down instead of raising everyone up. While waiting with Miguel, another of his friends came, his name is Nasser. Once I said I am from Sudan, he greeted me in Arabic. Nasser is an Algerian, who came to Cuba in the eighties and fell in love with the island and a woman, and never went back ever since. Another one of the surreal stories that Cuba randomly throws at your face. Anyhow, Miguel, Nasser and me were laughing and talking like good old friends already. I told Miguel that instead of paying 10 CUC to Viazul, I’d rather pay the same to him and hire his taxi. So I set on a mission to find other tourists to share the taxi. I found a Russian couple who also wanted to go to my same destination (Cienfuegos) and they accepted to share a ride instead of waiting for the bus. I shared one last drink with Miguel and Nasser and then got on the taxi. The Russians were worried about Miguel driving the taxi with a beer in his hand, I lied to them and said it was his first drink. On the taxi, we continued the filthy Spanish lessons. We talked about his girls and his life. His tenure in Venezuela as a doctor which seems to be the best option Cuban doctors have to get out of poverty. I asked the Russian tourists about their jobs and it turned out they were doctors as well. They didn’t speak much Spanish so Miguel told me to ask them whether they also need to work on a taxi in their home country. I asked them and they didn’t answer. We all knew there was no need for an answer. I already spent 3 days in Havana and I must say that I was beginning to feel disappointed. I always had a very dreamy picture of Cuba and Cubans. For me, they were all bearded revolutionaries fighting for justice and full of love for life, I forgot the simple fact that people are people, and poverty and revolutionary idealism just can’t thrive together. What was shocking about Cuba after these three days though was that, at many times, Cuba felt even poorer and more miserable than Khartoum or Cairo’s poor alleys, you can see this poverty in all the jiniteros hustling tourists in hope of ridding them of some of their dollars and euros but also just in the exhausted eyes of older men and women. I felt uncomfortable with the situation initially, I wouldn’t accept distancing myself as most westerner tourists do, but in the same time, I recognized that – in the eyes of Cubans – I am yet another tourist even if hold an identity and a passport as cruel and as miserable as theirs. But by the fourth day, my trip was about to take a massive shift. I decided to head east from Havana with my German friend Miriam that I met in the hostel in Havana. Our final destination was the bay of pigs with a stop at Matanzas on the way. We decided to take the old electric train to Matanzas, it is an old train that resembles Heliopolis trams in Cairo albeit it functions in much more beautiful surroundings. We headed towards Casablanca – the station on the other side of Havana – it is the most unassuming train station I ever saw, it looks like any other colonial house in Havana. The old train departed exactly on time in a precision that astonished even my German friend. It started rolling very slowly in the middle of the beautiful nature of the suburbs of Havana. In front of us, was a family formed of a father and his daughter, and as the train went forward, more members of the family joined them at different stations. In about an hour, there were more than 10 members of the family from the grand father to a baby who is probably the fourth generation of the family. The train reminded me of my father’s stories about Kareema’s train in Sudan, it was rolling slowly from one station to another taking its time at each stop allowing passengers and workers to chat with their friends, that train – as well as Kareema train probably – are the extreme opposite of Europe’s miserable punctual and spiritless trains. Two hours into the trip, an electric fault happened and the roof of the train went on fire. All of a sudden, there were blazes of fire falling from the windows into the carriages. For a moment, I thought I was dreaming until people started running around me, and the train stopped in the middle of the villages. We got off the train, sat down on the grass while people were chatting and drinking loudly. One Cuban came to talk to us, a doctor who speaks English fluently, he explained how these accidents are very normal on this train, and the problem will be fixed soon and we will continue our way shortly. Meanwhile, the train staff were fixing the issues accompanied by lots of passengers who didn’t shy from providing their knowledge and expertise to the cause of getting us moving again. The train finally moved, and we arrived to Matanzas, strangely enough, on the exact scheduled time as if this accident was completely accounted for. When we arrived. we joined another tourist from Spain named Jorge, and we decided to look for a casa together. We found a great casa with a huge room with three beds, which looked – as most of the casas – as if it belonged to a family that was extremely rich before the revolution. Jorge is an architecture student who is spending a semester in Mexico, an extremely clever and knowledgeable young guy, one of these young Europeans that I keep meeting and wonder how beautiful and fair Europe would be – to itself and others – if it gets ruled by this generation one day. 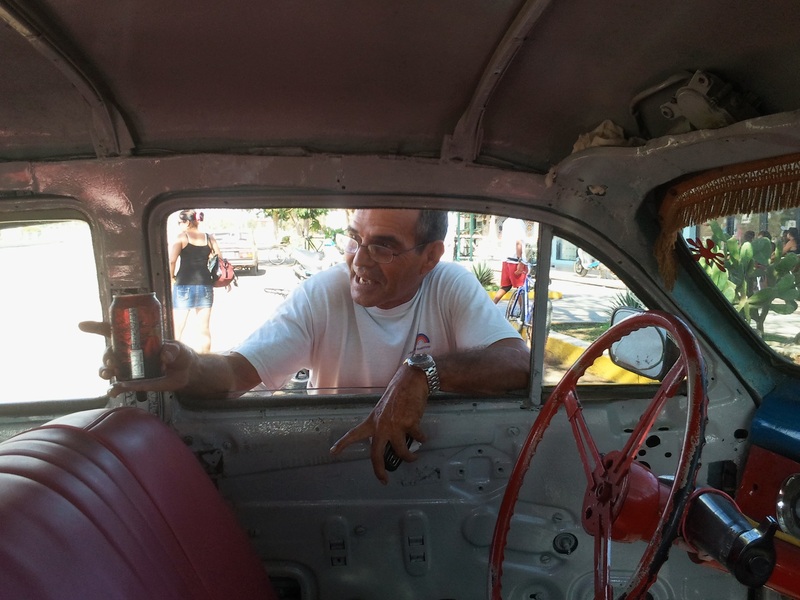 We put our bags and headed for a walk around Matanzas, we went to a local restaurant where we can pay in moneda nacional – Cuba has two currencies – and I found out, thanks to Jorge, how much we can change the course of our trip once we start using moneda nacional. It is not just because of saving money, but because it opens the ability to travel, eat and enjoy Cuba more like Cubans. We had our good food then sat down near the railway track looking at the rusty malecon of Matanzas and talking about all sort of things for hours.